Inder Loves Folk Art: Clean slate. 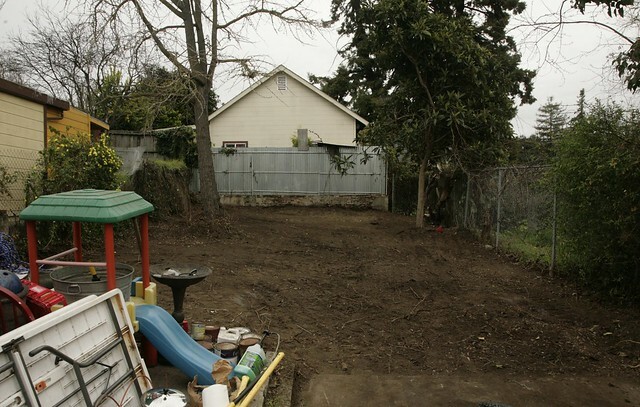 Here is our backyard as of this morning, stripped bare, minus almost a foot of topsoil. Down to two trees: A loquat tree and a gingko. 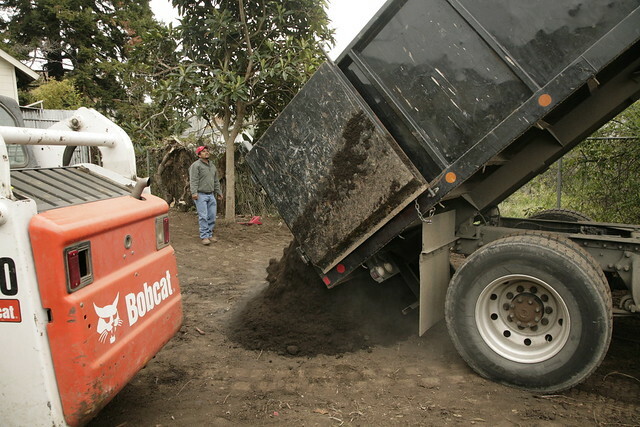 Our guys came by this morning with a dump truck full of clean top soil. Amazingly, they were able to back the big truck up our narrow driveway, straight into the back. These guys know how to drive. See how we still have a gate to our side fence, but no fence for it to latch to? Classy, huh? It's not everyday that you see a truck this size in the back of your house. We still haven't decided how we will use all of this space. Honestly, after losing so many trees, I'm not even sure which part gets the most sun! Right now, our first priority is to build a new side fence, to contain the dogs for their routine trips outdoors to do their business. 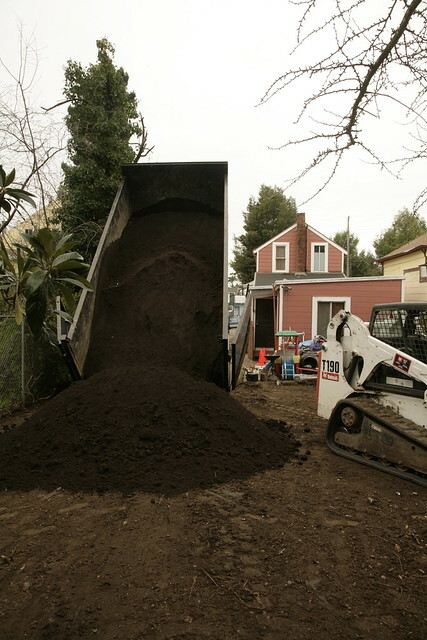 Second priority is to get some mulch and perhaps a bit of turf down to reduce the amount of mud going everywhere, especially back into the house on the paws of dogs. I shudder to think how bad it could get if it ever really starts raining. P.S. Our next door neighbor grew up in his house, and he remembers from childhood hearing some older folks in the neighborhood mentioning that there used to be a barn behind our house before World War II (and the accompanying housing boom that filled up our neighborhood). This provides a possible clue to the lead in the soil, because it's likely that any structure would have been painted with lead paint, and a barn could have been used to store cars, tractors, or car parts (all during the time when leaded gas was the norm). Of course, who would guessed this in a million years? A barn? In downtown Oakland? Yeah, sure, dude. But 120 years is a pretty long time in the history of California. I wish I could have seen my "neighborhood" back then. Well a ginkgo and a loquat are two pretty awesome trees to be left with. I bet this time will be etched in Joe's memory with all the heavy vehicles! Wow, that's still unbelievable that all that's happening. I'm glad it's getting sorted out so you'll have a new happy healthy backyard! Despite losing trees, it's kind of nice to have a whole 'new' backyard to work with. I'm glad things are getting sorted for you with the lead issue.